Stones on stones this week at the Bridgestone at Firestone GC. It’s a WGC event meaning good, limited field. Also being played at a different time of year than normal! Dumb Olympics. Still expect a bunch of good golf! Despite the ‘U’ in the title, damn catchy song here. Firestone is one of the more interesting courses on Tour in my opinion, and it has nothing to do with the uniqueness of the course. Because it isn’t unique at all! The course is completely tree lined, and basically every hole but a few look exactly the same on TV. 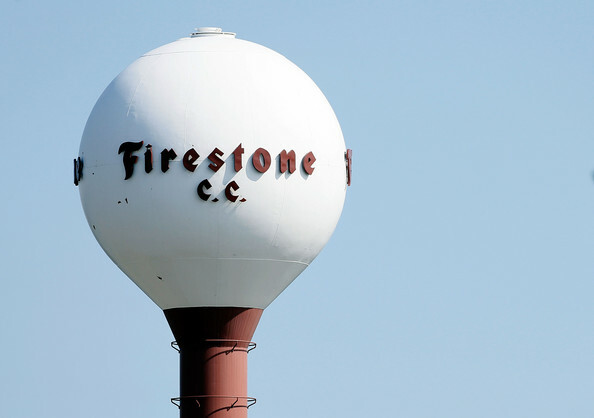 So besides the Firestone GC watertower that will surly get a lot of airtime when they come back from commercials, I’ll highlight the holes that do look a little different and are recognizable. 16 — Known for it’s length, at 667 yards, and a pond in front of the green. That’s about it. But really, it’s fun the few times a week where someone decides to go for it in two. Also, since it’s near the end of the course, it plays a part coming down the stretch. With the final round hole location near the water, it’s a rare par 5 where you might be hoping for a par. Look at how well Tiger stays in posture there. So pretty to look at. 18 — It’s got a tree in front of the green. Kind of cool, kind of gimmicky, but definitely notable. And because I love Tiger, and feel he needs recognition whenever, here’s a video of him hitting it over the tree in the dark. Did I mention Tiger? WGCs, and the Bridgestone at Firestone specifically have been really good to Tiger. Tdubs has won there 8 times in his career. Yup, 8. And there have only been 16 events meaning he’s won half of them. Favorite Tiger stat of the week is that Jason Day and Adam Scott, winners of the first and second WGC events this year respectively, are looking to become the third person to win multiple WGCs in a year. Tiger did that 6 times. Why you hurt Tiger?! I want to watch you play golf again. Of the top 50 in world ranking, only 40 are teeing it up in Akron. Usually a full field, there are 10 Euros who decided to say “Screw it” and play in le Open de France. This list includes now #4 in the world, Rory McIlroy. Travel is tough, making the schedule work out is tough, and when they throw curveballs like putting the dumb Olympics mid August, you get players not want to deal with all that travel. And so a WGC event slips a little in stature for no good reason. Side note, Rory’s got to get it together and start playing well. The limited field WGC event means there’s an opposite field PGA Tour event again! This being the Barracuda Championship out in Reno Nevada. Things to look forward to this week are really long drives from the thin air out in the mountains, as well as the Stableford scoring system. Fans of the Tour in the past remember the old International out in Colorado which used the point scoring system that favors birdies and bogeys to pars. It’s definitely a fun change to normal 4 round stroke play events. And since it’s out near the west coast, we get to watch that on TV live after the Bridgestone finishes. And everyone loves more PGA Tour caliber golf!